-a shapefile of the boundaries of the smallest subdivisions possible for that country (akin to Local Super Output Areas for the UK or Buurten for the Netherlands), which includes data of the population and area (or density) of each of those subdivisions, and preferably also the population centroids of each of the subdivisions. I've found a 1km^2 grid for Germany, but not for the other two countries. Does anyone know where I could get these shapefiles? I would prefer shapefiles based on 2011 census data. I've looked on Eurostat, but they don't have built-up area shapefiles, and they only do detailed shapefiles for the whole of the EU put together, which my computer isn't powerful enough to cope with. You can also check out Global Administrative Areas (GADM) here which is is a spatial database of the location of the world's administrative areas (or adminstrative boundaries) for use in GIS and similar software. Mapzen automatically extract the latest OpenStreetMap data into manageable, metro-area shapefiles in a variety of formats for you to use. 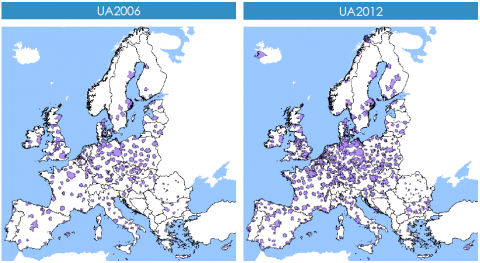 The Urban Atlas data from the European Environment Agency should also be of use. It provides "land use and land cover data for Large Urban Zones with more than 100.000 inhabitants as defined by the Urban Audit". Here shown is the class 111+112+121+122 for Hungary. The dataset is unfortunaly 10 years old (CLC2006). Changes between 1990-2000 (urban morphology),1990-2006 and 2000-2006 (Vector and Raster data about changes between the CLC1990, CLC2000 inventory and the CLC2006 inventory) are also available. The urban morophology dataset has a short list what kind of layers of the list above are used, to calculate this data set. Not the answer you're looking for? Browse other questions tagged shapefile data germany france belgium or ask your own question. Worldwide population density data not grouped by country? Mass Geocoding Requests for Germany?